This chili with beans and meat recipe is a favorite in our house, and can be seasoned to taste to create a mildly flavored dish or one that is extra hot for those who enjoy some additional spice. As is, this chili is not too spicy but has just enough kick and the ingredients that go into it, give it teriffic depth of flavor. Heat oil in a large heavy-bottomed nonreactive saucepot or Dutch oven mediun heat. When oil is shimmering, add the onions, bell pepper, garlic, chili powder, cumin, coriander, pepper flakes, oregano, and cayenne. (Dry seasonings are added at the beginning with the onions so the spices release their oils and the vegetables have enough time to absorb all the flavors.) Cook the mixture, stirring occasionally, until vegetables are softened and lightly colored, about 10 minutes. Increase heat to medium-high, add half the beef and lightly season with about 1/4 teaspoon salt. Cook, breaking up the meat with a wooden spoon, until no longer pink and just beginning to brown, roughly 4 to 5 minutes. Add remaining beef and lightly season again with about 1/4 teaspoon salt. Cook, breaking up the meat with a wooden spoon, until no longer pink, another 4 to 5 minutes. Add beans, tomatoes and their juices, tomato puree, and about 1/2 teaspoon salt. Bring to a boil, then reduce heat to low and simmer, covered, for 1 hour, stirring occasionally. Remove lid and continue to simmer for another hour, stirring occasionally, until meat is tender and chili is slightly thickened (if chili begins to stick to bottom of pot, stir in 1/2 cup water and continue to simmer). Taste and, if necessary, adjust seasoning with salt. To serve, ladle into bowls, and top with your favorite condiments. Makes about 8 to 10 servings. Slow Cooker: Cook vegetables and meat as directed above then add cooked meat mixture to a slow cooker; stir in the beans, diced tomates, tomato puree, about 1/2 teaspoon salt, and cook on the high setting for 4 hours. Cooks Notes: If you're a fan of spicy food, try using a little more of the crushed red pepper flakes and/or cayenne...or maybe add a couple seeded and diced jalapeno peppers. 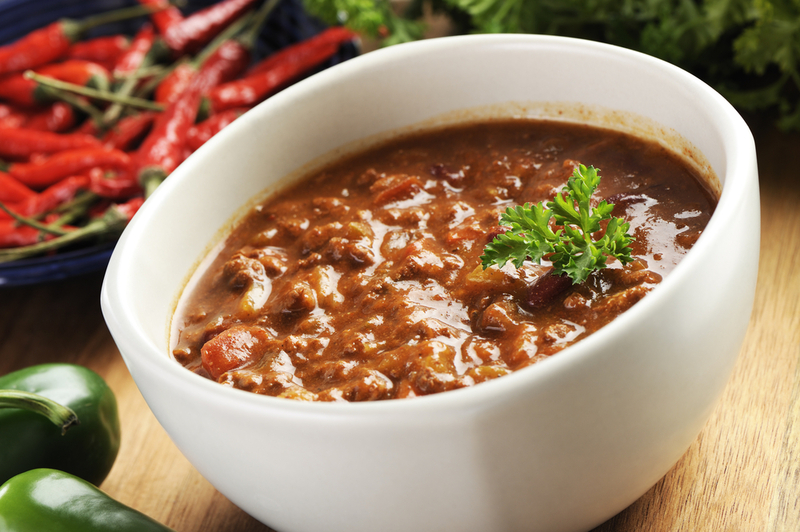 The flavor of chili improves with age. So, if possible, make it one to three days in advance and reheat before serving.